The title of this exhibition is fairly self explanatory. It is a bin of art; a disposal unit for self-deprecating artists’ most scorned pieces. Landy has described his art bin as ‘a monument to creative failure’ – the exhibition is a collective snub of all the works that brought only disappointment to their creators. The result is fascinating – and good fun. Landy’s general idea was that over the course of the exhibition, sildenafil anyone could bring in unwanted pieces, try that the (destruction obsessed) artist would then put into the Art Bin if he felt they merited ‘rubbish’. The collection acquired is quite impressive. On my visit, I was lucky enough to see art being put into the bin. A non-descript abstract portrait was walked up the stairs that led to the metaphorical bin lid, where it was then hurled into the collection: the frame smashed on impact, and it was strangely elating. As a perpetual hoarder, wandering around the giant structure was initially a little uncomfortable. 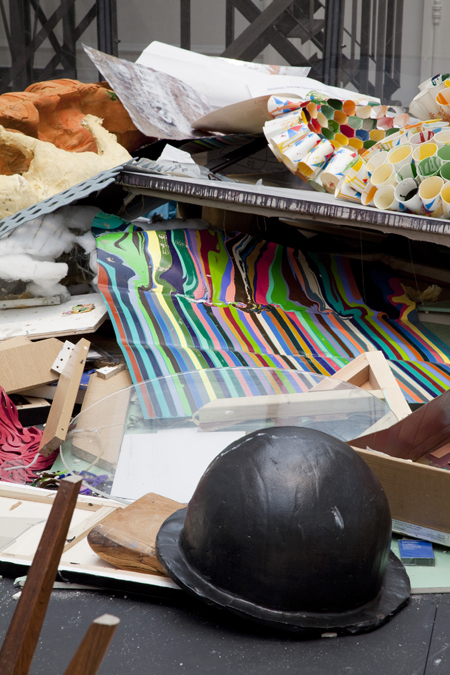 Seeing some remarkable works strewn amidst heaps of broken sculptures and torn canvases makes you feel somewhat sorry for the talented artist that discarded what others would aspire to achieve. This, however, was short lived; and the overriding experience was one of creation rather than destruction. The exhibition drew attention to the contributing artists’ personal drive to do better – and to not to dwell on unsuccessful works. Landy’s continual return to destruction as a theme harks to a wider area of contention within the art world. Indeed, the anti-establishment-ism of his projects work to antagonise the way in which art institutions and media outlets can influence – and either corroborate or reject – any individual artist. 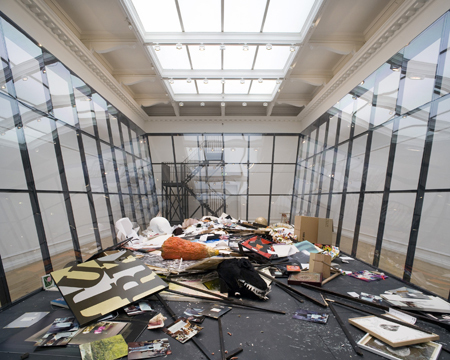 From the artist responsible for Break Down – in which Landy systematically destroyed all of his personal belongings over a two week period in 2001 (birth certificate included); Art Bin is very much an extension of his own personal ethos. It is an open invitation for other artists to join up to the destruction brigade, and relish in the freedom it brings.